Have a Question About Us? Get In Touch. We’re Always Here to Help and We Would Love to Hear From You! Please choose the message category. Please tell us whether you are an existing member. Do I need to have experience before joining? What forms of payment are accepted? How quickly can I achieve success online? Do I need to have experience before joining? At Wealthy Affiliate all of our training starts from ground zero and we do not assume that anyone has experience. Many highly successful members started out with no technical knowledge and no experience with the Internet. If you can write an email to a friend, you can be highly successful at Wealthy Affiliate! 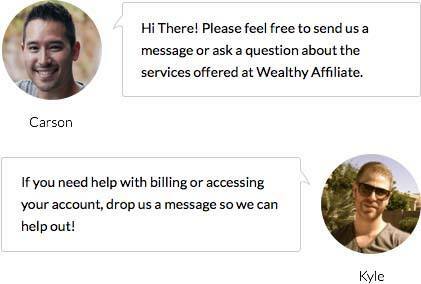 We accept Visa, MasterCard and PayPal as forms of payment for Premium memberships at Wealthy Affiliate. You can choose to use a credit card today, then change to PayPal at a later date, or vice versa. You are in full control over your billing and can choose what works best for you. How quickly can I achieve success online? We get this question all the time and the answer is that it "DEPENDS" on one thing, it depends on you!